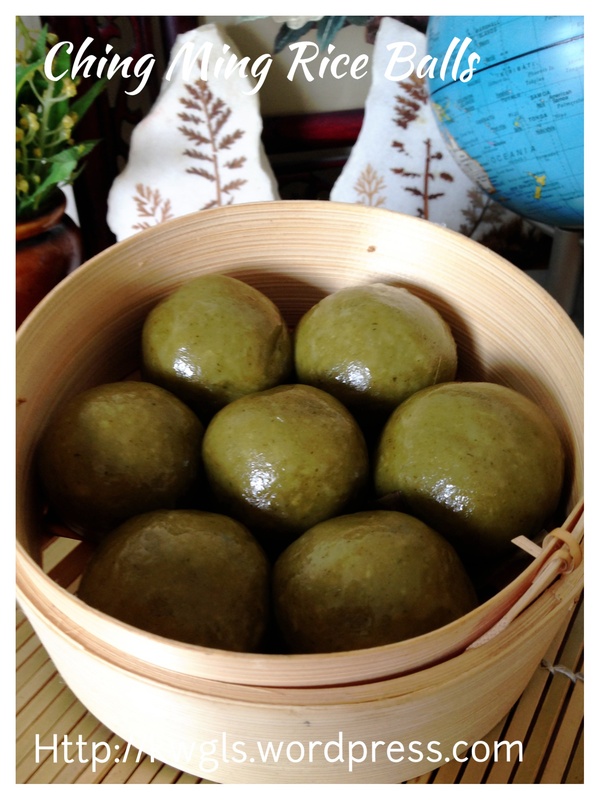 This is a rather special type of steamed glutinous rice cake of my dialect, Chawan or Zhao An (诏安）. 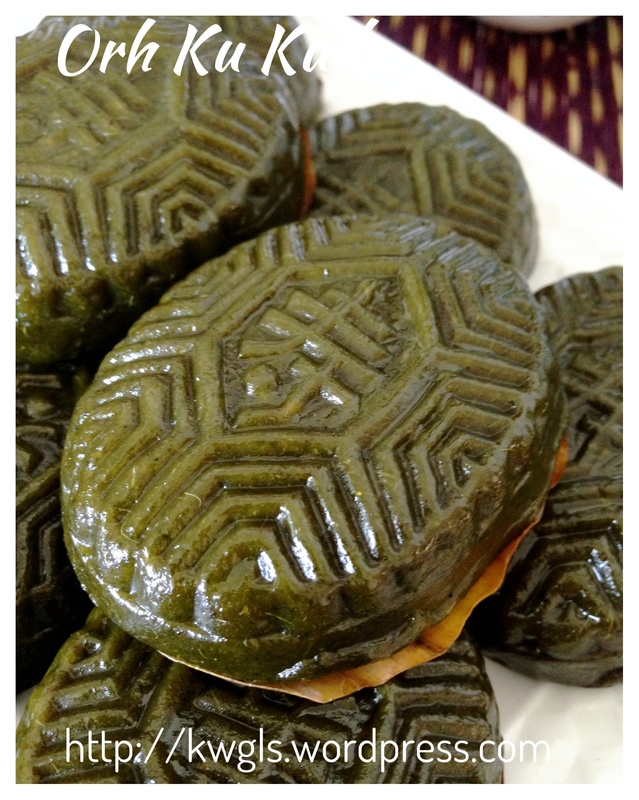 It is usually prepared for the Chin Ming Festival and Hungry Ghost Festival only. 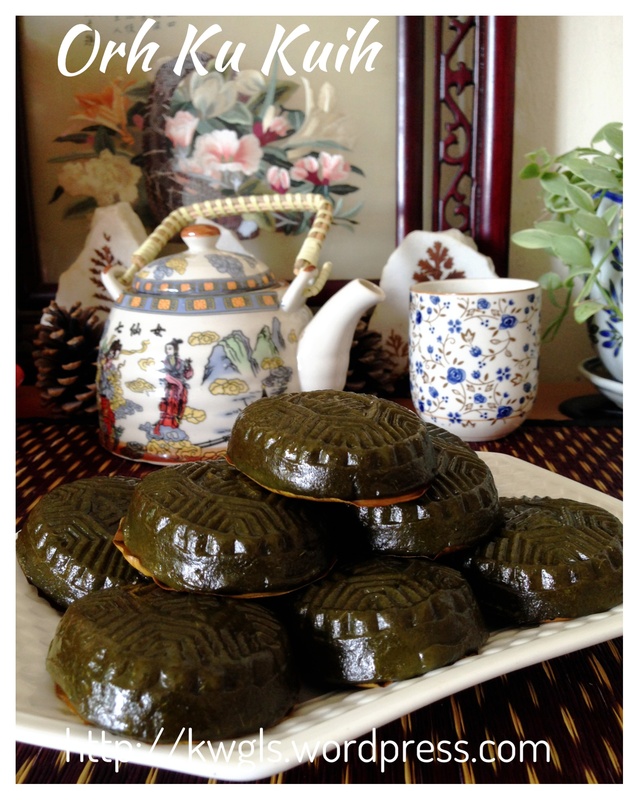 Literally, it was translated to the black tortoise cake (黑龟粿 or O Ku Kueh）. 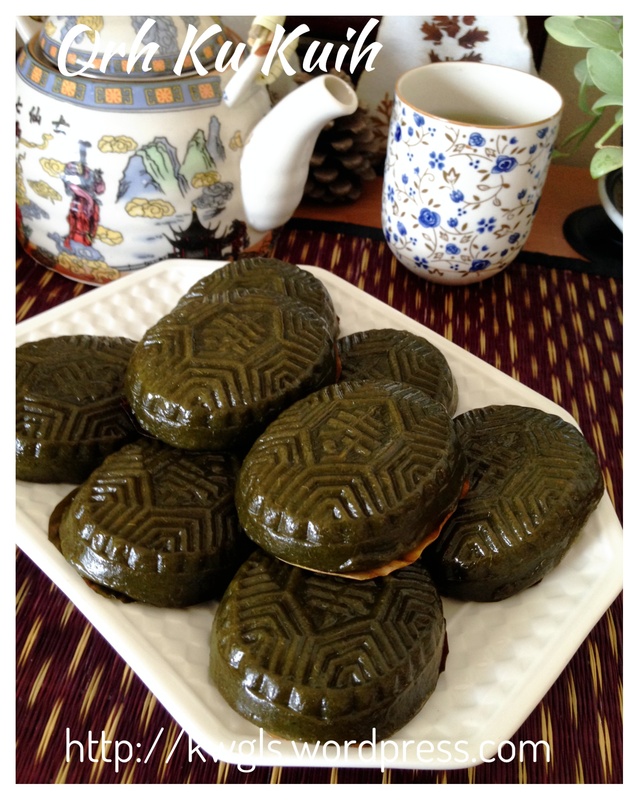 Though it is called black tortoise cake, it is not exactly “black” but in the shade of dark green depending on the type of leaves that were used. This cake come with a special split mung beans filling. 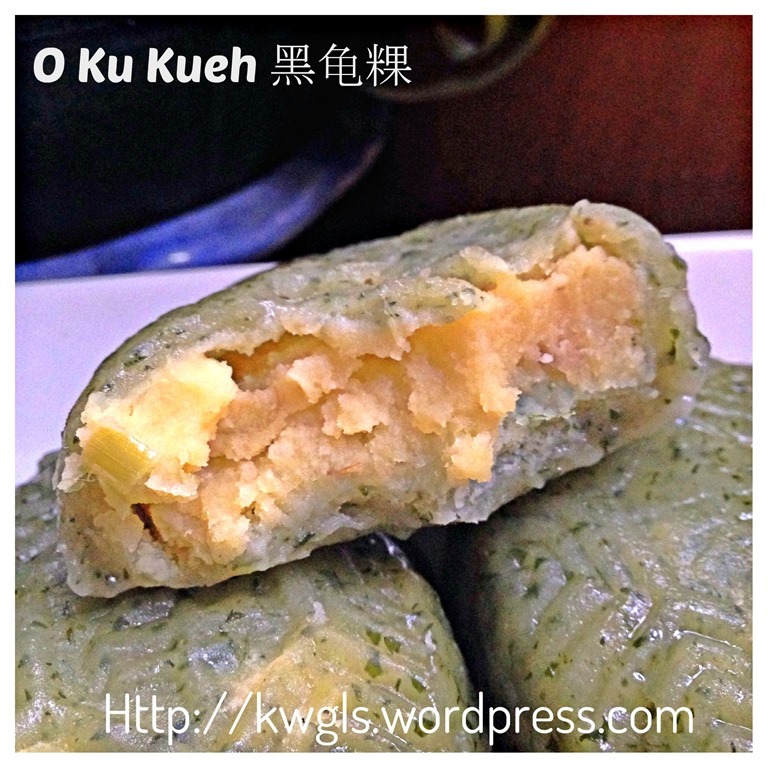 A savoury mung beans filling with a balance of sweetness and saltiness. Spring onions were first sautéed and the split mung bean fillings were stir fried until fragrant followed by the addition of sugar and salt. Traditionally, lard were being used for the preparation. However, in recent years, normal cooking oil or peanut oil were used instead of lard. Putting health concerns aside, in my humble opinion, the use of lard is much aromatic than the use of cooking oil. I did not have a recipe to refer when I prepared this special cake. Therefore, I have prepared these based on my memories of the cake that I have tasted when I was young. As mentioned above, I got to eat this cake only twice a year. 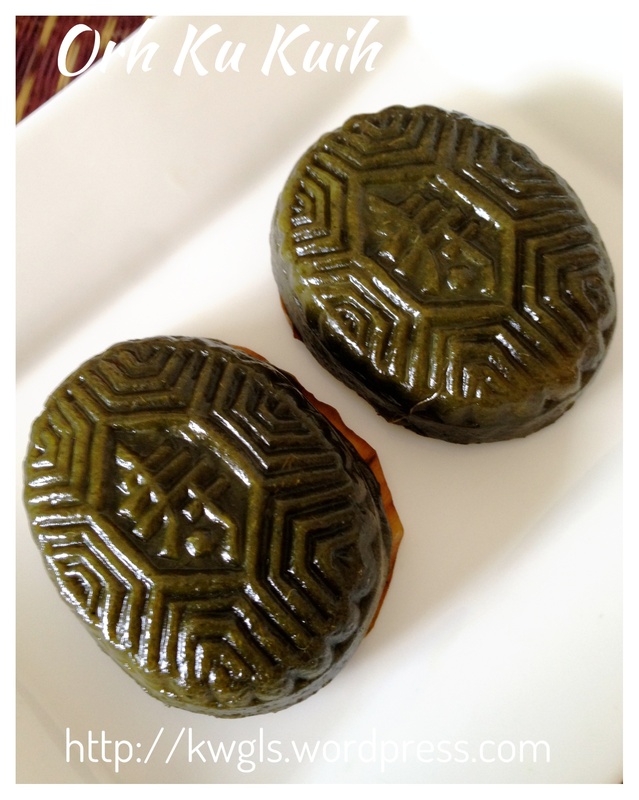 One during Ching Ming festival or tomb sweeping festivals and Hungry Ghost festivals. It is not commonly sold in the hawker centre, even if it is sold, the dough and the fillings are different. I have therefore decide to replicate the cake as a gesture of respect to the traditional cuisines that I have eaten before. Soak the split mung beans with adequate water for about 1 hour. Clean and drain. In a pot with 300 ml of water, place the split mung beans. Bring to boil. Once boiled, lower the heat to medium and let it simmer for 10-15 minutes. 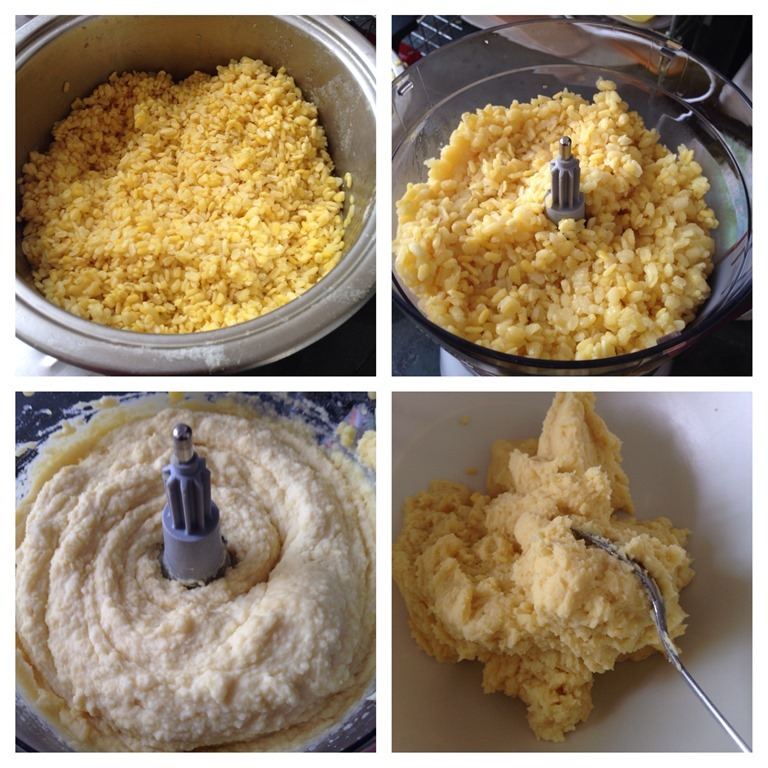 Cool and transfer to a food processor. Blend until your desired texture. 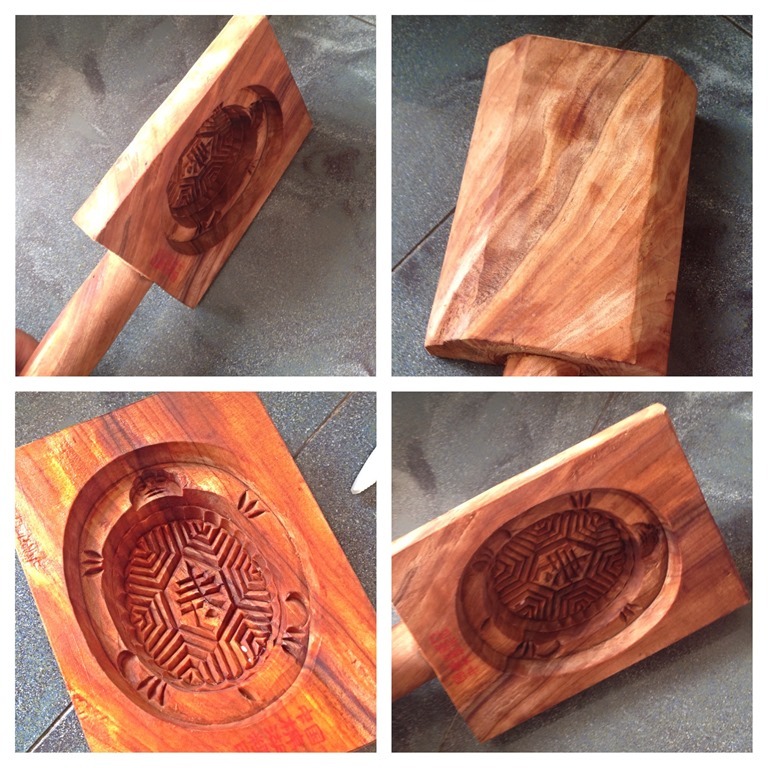 Transfer to a clean bowl. Chopped the white portion of spring onion. In a stir frying pan, add the cooking oil, stir fry the spring onion until aromatic and slightly brownish. Add in the split mung beans, stir fry for 1-2 minutes until well combined. Add in sugar and salt, stir until well mix. Cool and set aside. In this step, it is wise for you to take a teaspoon and taste the mung bean filling and add additional salt or sugar if desired. In a pot with some water, add the mugwort leaves and bring to boil. Let is boiled for 3-5 minutes until it is soft. Drain, cool and transfer it to the food processor. Blend it as fine as possible. Set aside for the preparation of the dough. 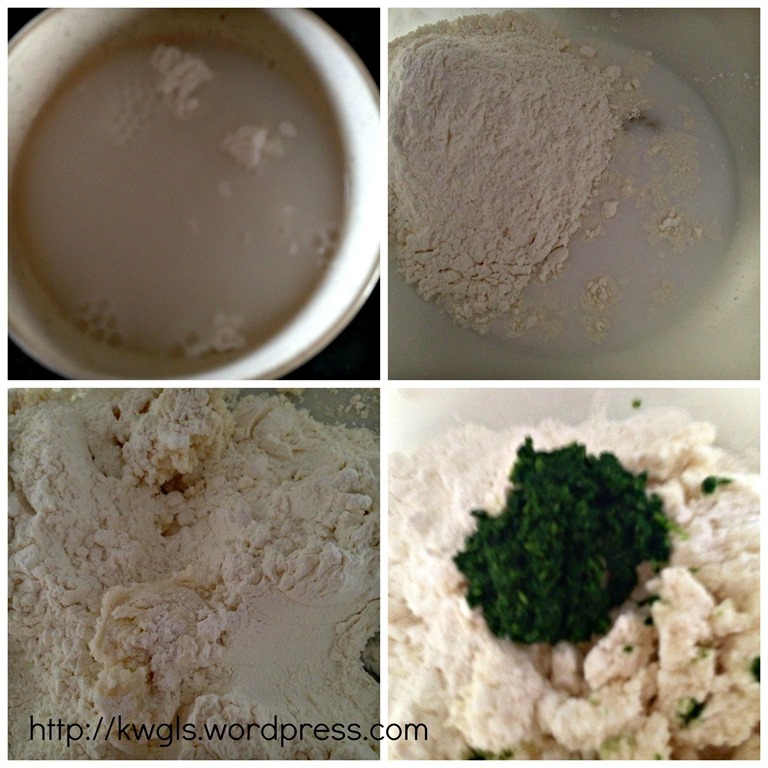 For the starter dough, place the rice flour in a small bowl and add the hot water. Stir until well mixed. Set aside. In a big bowl, place the glutinous rice flour and sugar. 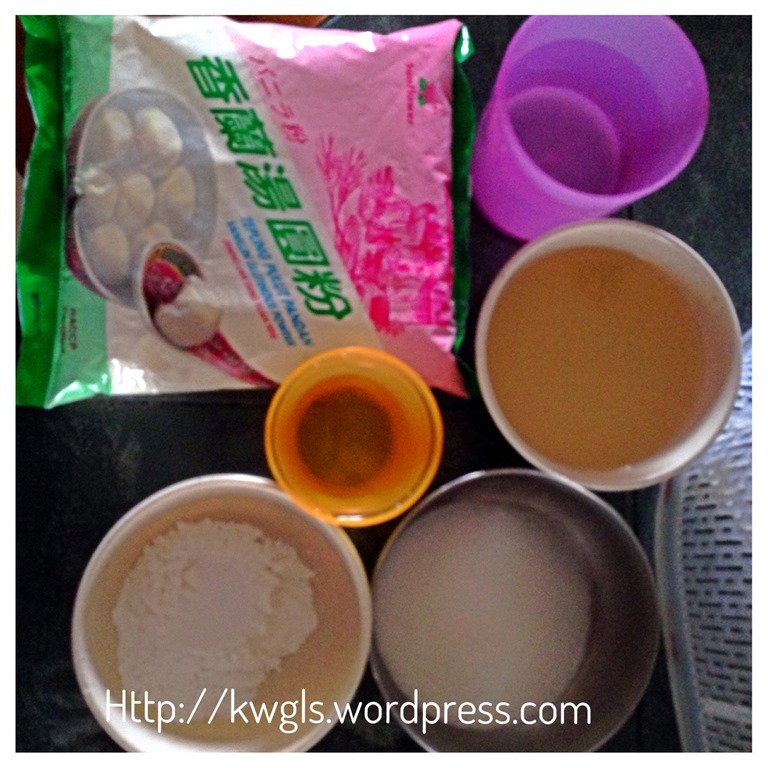 Make a well in the centre, add the rice flour mixture above, follow by warm water and oil. Add gradually, Knead until it become a pliable dough. 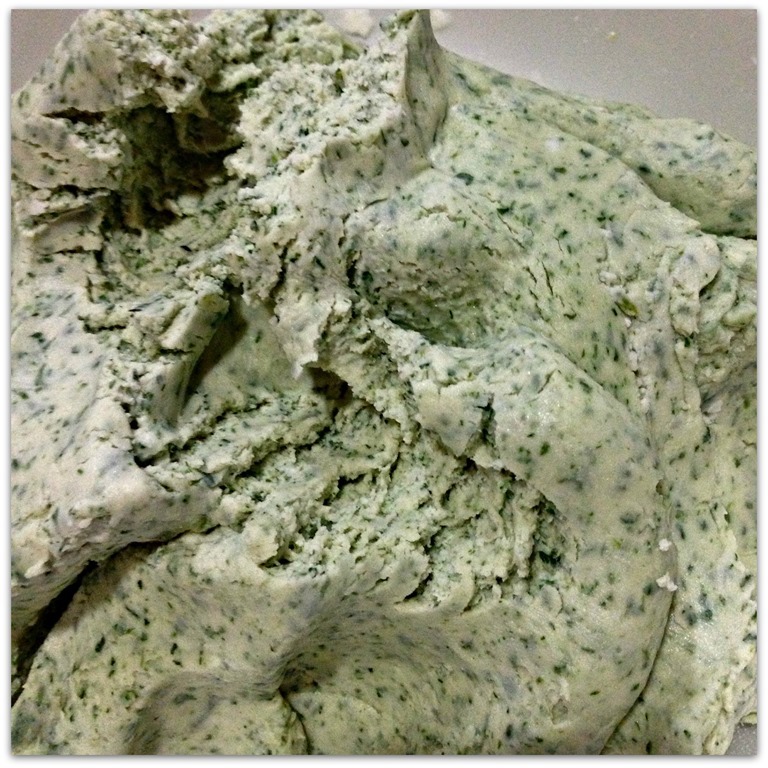 Transfer the dough to a food processor, add in the cooked mugwort, blend until well combined. Set aside for later assembly. Divide the dough and the split mung beans filling equally. Every mould is different. 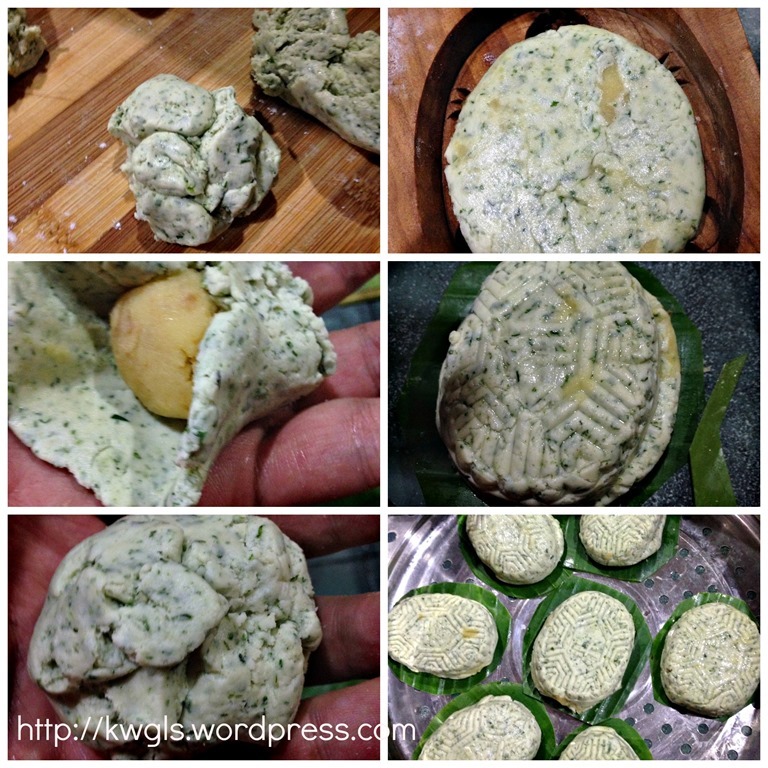 For my angku mould, I have use about 40 grams of dough with about 35 grams of filling. You can shape the dough and fillings into a small ball first before you start the wrapping process. For the wrapping, take a dough, flatten it, and put a filling ball on top of the mugwort dough. Seal it and make it in a big round ball. Put the ball on angku mould. Press it down as firmly as possible. To take out the rice cake, knock the side of the mould against the table . Place the rice cake on top of a piece of the banana leave. Steam the rice cake in the steamer for about 8-10 minutes. Too long the steaming time can blur the imprint. 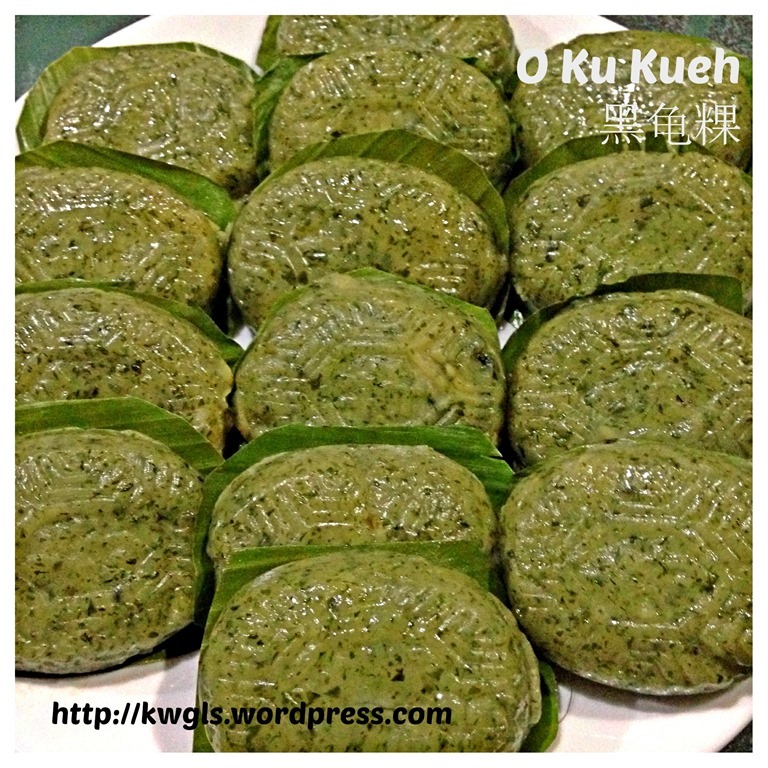 While in Singapore and Malaysia, most dialects have green color kuihs for Ching Ming. 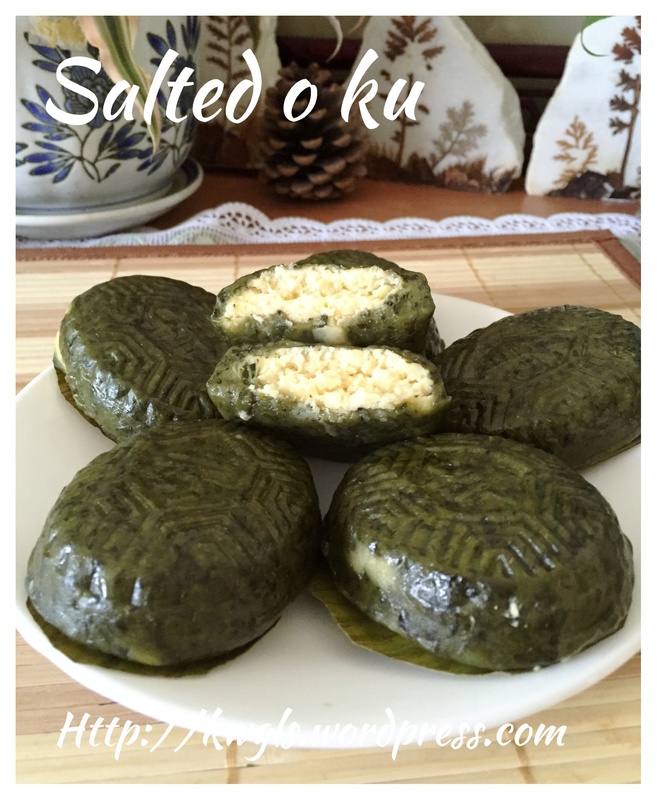 In my humble opinion, it actually developed from some green colour rice balls commonly only available during Ching Ming period in central China. 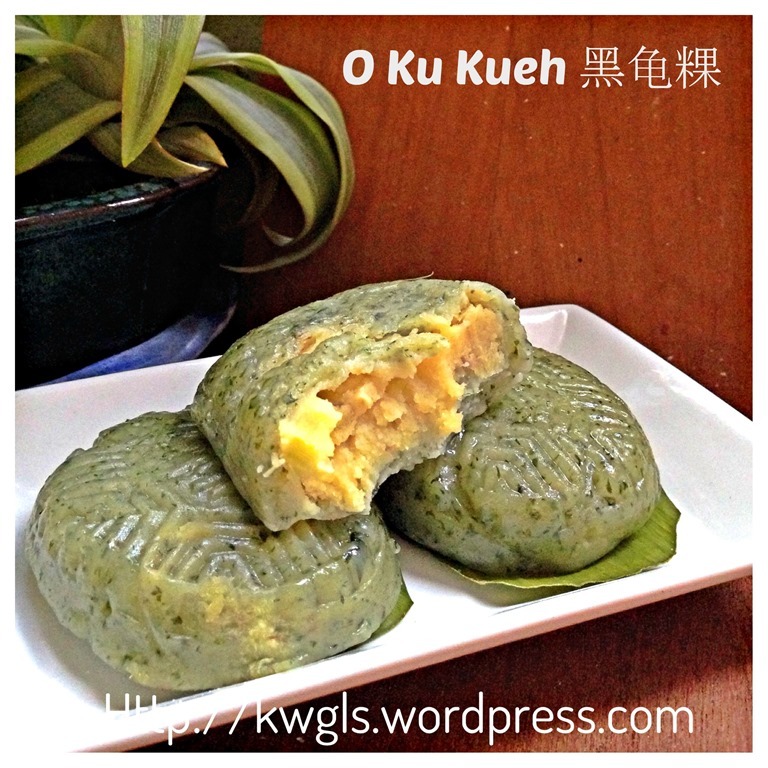 When these green colour rice balls reached Fujian and Guangdong province, it was transformed into the common tortoise shape for the Hokkien dialect (o Ku), the peach shape (chi kak kuih or hia kuih) for Teochew dialect and the dumpling shape for the Hakka dialect (ai pan). As to the filings, it can be savoury radish or bamboo shoot fillings or the sweet fillings like mung bean, tausa etc. 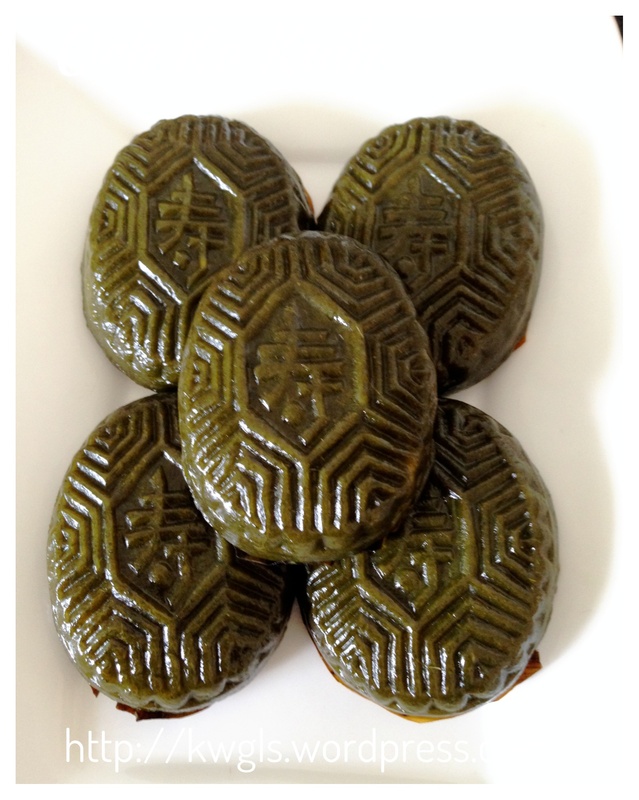 Salted mung bean fillings with ginger is a unique filling for the dialect Chawan and Teochew. 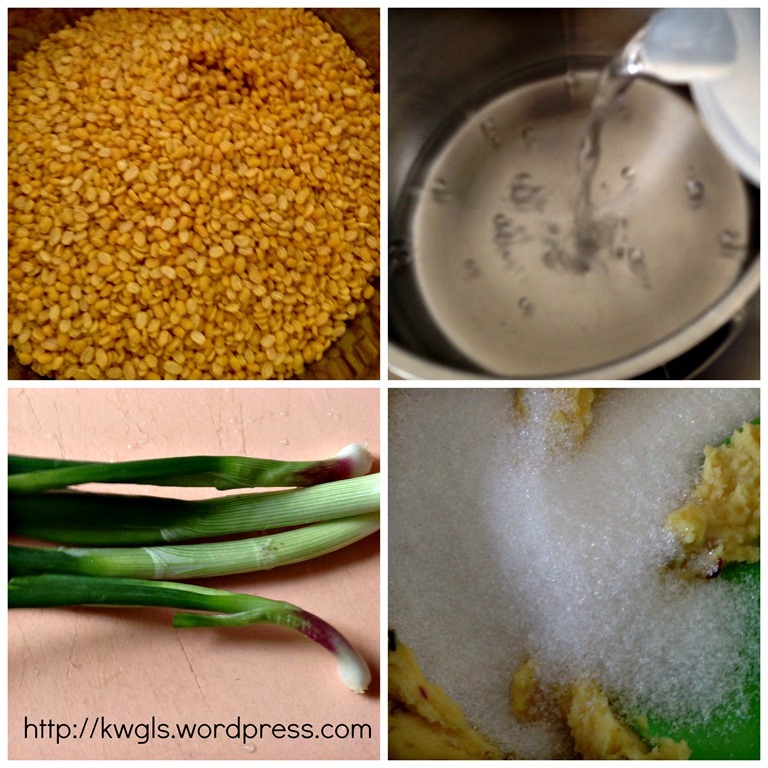 One reader is requesting for the recipe and I have prepared a small portion for this purpose. My late aunt used to prepare this. This is not a filling that most people will appreciate. The fillings can be very dry, slightly spicy because of the ginger and rather salty. Once it was eaten, it may drop a lot of debris into the floor. This recipe has been modified to suit modern taste buds so as to make it moister and less salty. Hope it will benefit those who are looking for this recipe. I have prepared this rice cake as a respect to the traditional cuisine that I have tasted and missed. Obviously, it is not commonly sold in Singapore or even in Malaysia. I am unsure if any readers will give this recipe a try but in my humble opinion, it is a much better than the red angku kueh. 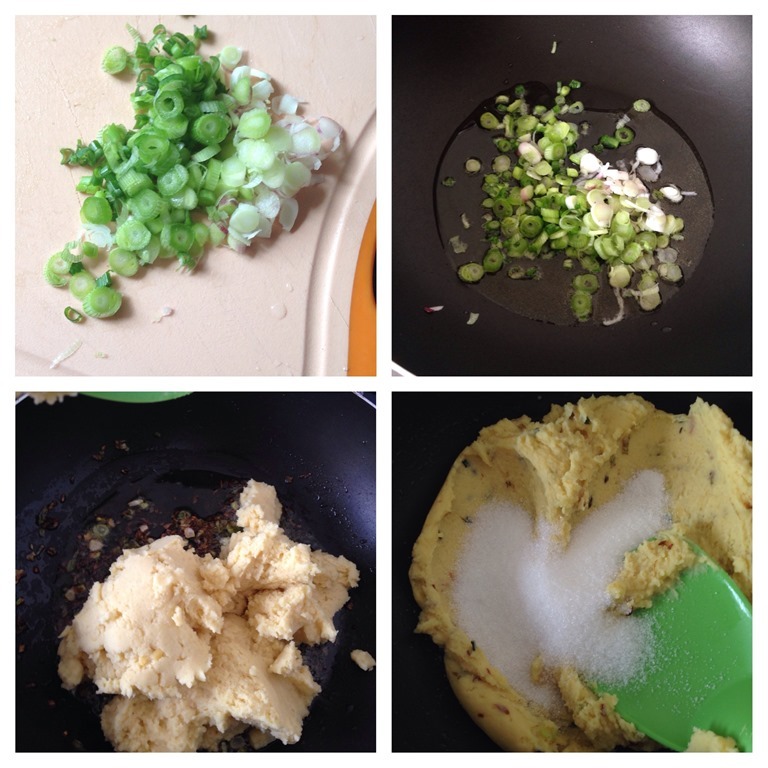 Try and let me know if this savoury split mung beans filling suits your taste buds. 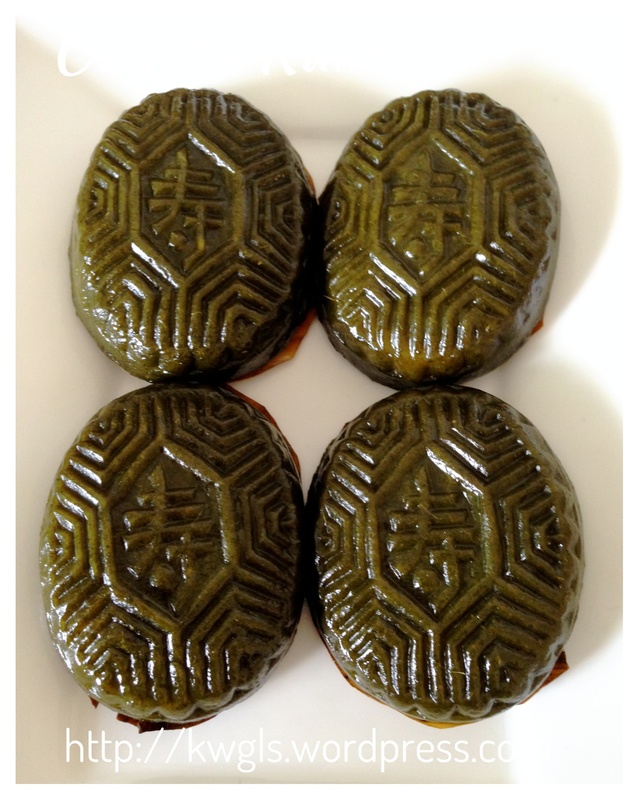 This entry was posted in Chinese and Asian Cakes and Snacks, Food Preparation Series and tagged 8, Angku, Black Tortoise Cake, 黑龟粿, GUAI SHU SHU, Guaishushu, kenneth goh, O Ku, postaday, Red Tortoise Cake. Bookmark the permalink. Hello, May I know where to find the Ramie Leaves? Hi where can i find 鸡屎藤? I may prepare one salty fillings recipe based on your request. Yes, I know . My auntie version is very dry and full of ginger flavour. 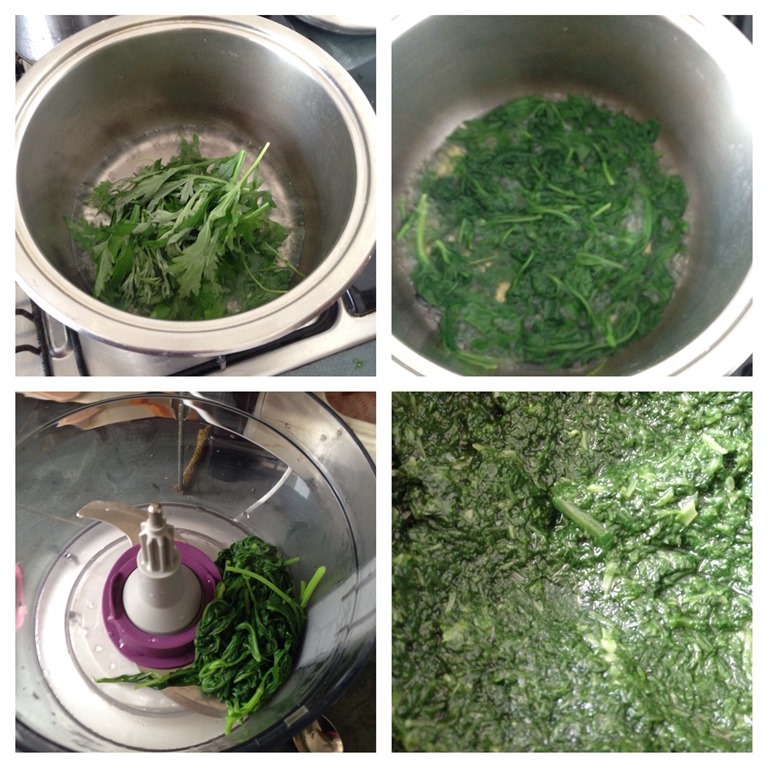 Hi, may I know where did you get the Chinese Mugwort 艾草? Did you grow it? I have been searching for some Mugwort plants for a friend who needs it for health reasons. Thanks. Thank you! I stay in Bedok. 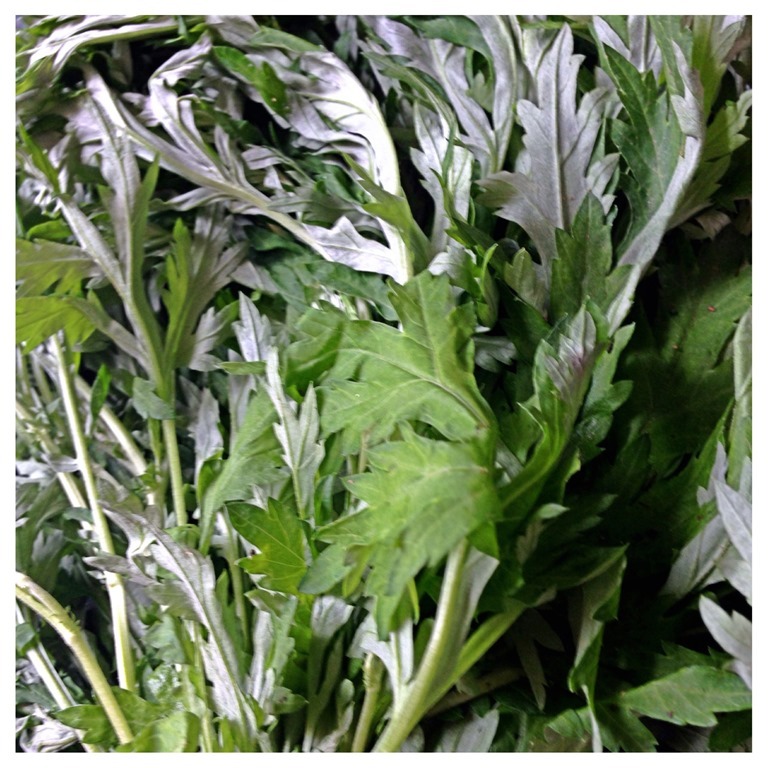 Mugwort is relatively common in most wet market including geylang serai.